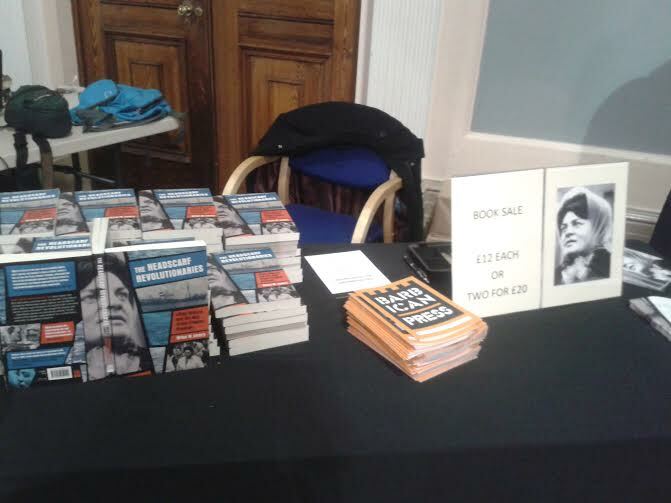 In this review I’ll be discussing Brian Lavery‘s The Headscarf Revolutionaries and also the book launch that took place on the 26th May at the Maritime Museum in Hull – in fact, my very first attendance at a book launch! 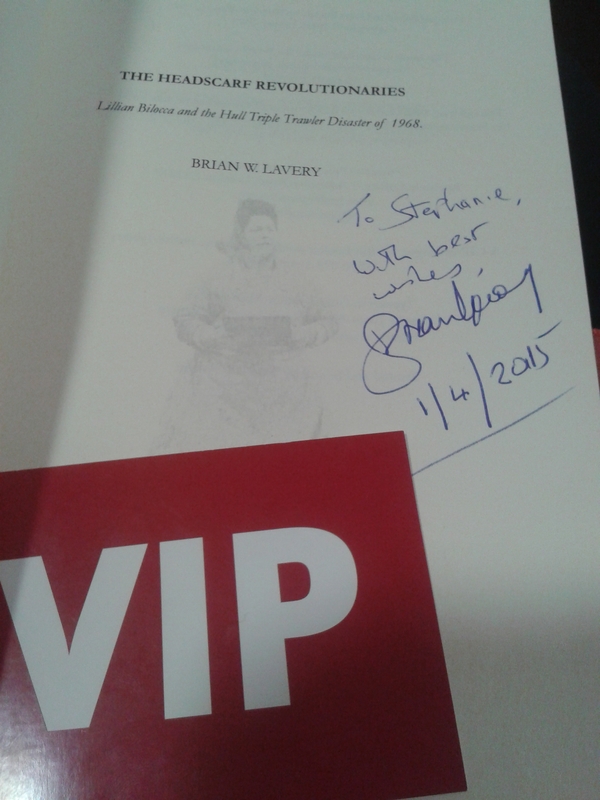 I would just like to take the opportunity to thank Brian for sending me a review copy of the book – I’m extremely grateful and will take good care of this signed copy! In the harsh arctic seas of 1968, three trawlers from Hull’s fleet sank in just three weeks. 58 men died. Lillian Bilocca put down her filleting knife, wrote a petition, and stormed into action. With her army of fishwives she took her battle to the docks and led a raid on Parliament. They changed the shipping laws. Lillian Bilocca became an international celebrity. The lone survivor of the tragedies made headlines too. In a tight fishing community, it’s dangerous to stand out. What I should first point out is that, while the fishing industry has been slowly dying out in Hull in recent years, the culture and camaraderie of those times are not lost. My granddad on both sides worked in the fishing industry. So did my parents. I come from a thoroughly working-class background right up until today’s generation and while mine is the first generation in my family to not be involved in the fishing industry, it’s still been very much a part of my life growing up. This isn’t just Hull’s history, it’s mine and my family’s. And that’s why I was so pleased when Brian sent me this book. In fact, I took this home with me to Hull one weekend and my mother, who is by no means a regular reader, took the book and wouldn’t let of it for a week. I had to drive back home without it. She read it extremely quickly, and even before I’d gotten my eyes on it I knew it was accurate due to her commenting every now and then, “Yep, I remember that. Yeah, your granddad was part of that…” etc. 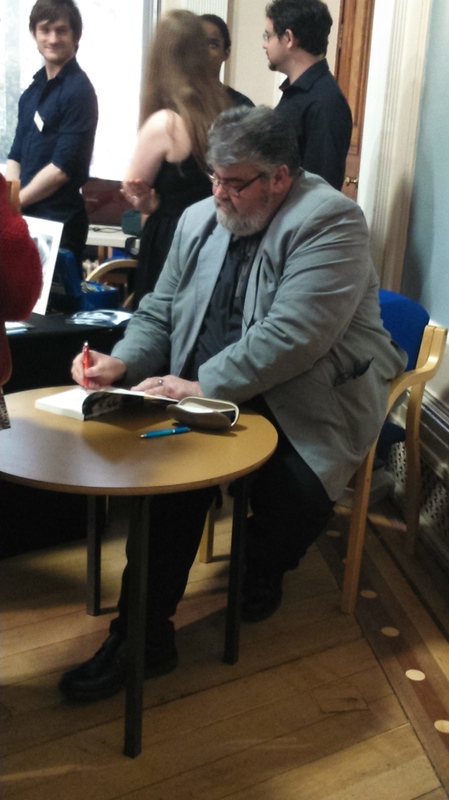 VIP at the book launch – not too shabby! The book tells the story of the triple trawler disaster, in which three trawlers (the St. Romanus, The Kingston Peridot, and The Ross Cleveland) sank between January and February 1968, killing all but one man on board. 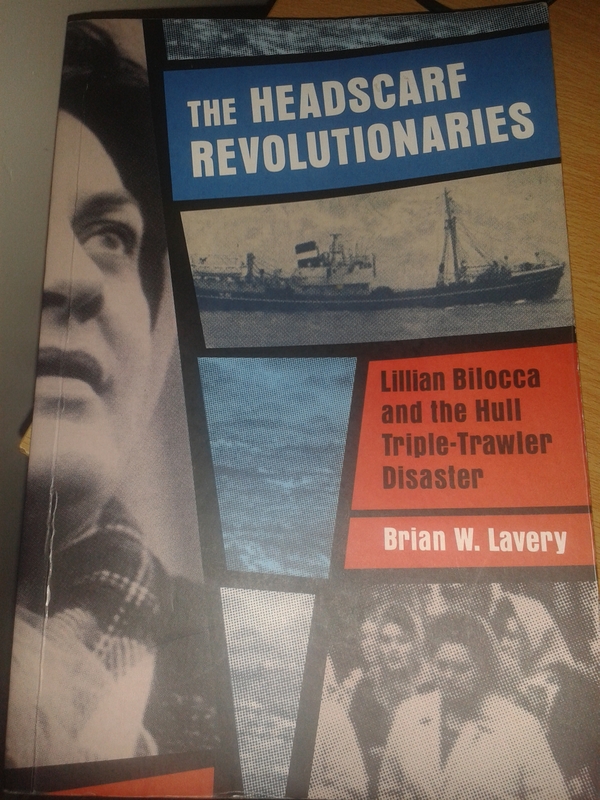 It also tells the story of the safety campaign that followed, spearheaded by Lillian Bilocca, in which she and a number of other trawlers’ wives fought, against much hatred and death threats, for better working conditions for men at sea. Men are rightly fearful when the ship climbs and drops, but that becomes terror if she moves from side to side. Huge waves must be faced head on. Taken sideways, they can send a ship to the bottom of the sea in seconds…When it goes wrong no one has time to act. Only luck can save her. Survival is by accident…If you are on deck, you are gone. Below deck, in a blink, the ceiling is now where one of the walls once was. The floor goes from you as you are thrown.The freezing sea is through the portholes. In the remaining minutes you drown or freeze to death. Your lungs will collapse in the cold before you get the chance to drown. If you get to a life raft a further miracle needs you to be far from the ship as she sinks or she will take you and your raft with her. Despite the fact that the author Brian Lavery, who was a classmate of mine at Hull University (you can learn more about him in my interview with him here) is originally from Glasgow, his understanding and love for Hull shines through the pages. Even in the early pages of this book in which he is really just setting the scene, he manages to capture that kind of close community that Hull had on its streets years ago, when everybody knew everyone and looked out for one another. It turned out Robert’s uncle Skipper Philip Gay of the Ross Cleveland had given the deck boy his old gear. Robert was Skipper Gay’s sister’s lad and he had been asked by the mother to “talk to the boy” – a euphemism for “talk him out of it.” Philip Gay paid lip service to this. He knew he would never be able to talk the boy out of his chosen adventure…. Jim also knew the cook Brian Wilson’s missus had just had a baby girl and he noticed too that Tommy Williams’ boys, John and Melvin, just twenty-one and twenty-two respectively, were aboard. Tommy was a pal of Jim’s dad, Fred. Brian did a fantastic job of stirring emotions and building up the reader’s loyalty to Lily Bilocca, Mary Denness, Yvonne Blenkinsop and Christine Jensen. What he also did was enable the reader to understand that even though the abuse, death threats, and resistance that these women faced were terrible, the circumstances of the time meant that reactions such as these were inevitable. Many trawlermen did not want women and wives in the public eye, did not want them interfering with their jobs. Many other wives also believed the women to be trouble-makers. Brian could have painted a black-and-white picture in which he outlined the abuse and portayed the women as heroes and the public as quite simply bad, unreasonable people. But his book goes into much more depth than that, and gives a rich cultural and historical background which explains that, whilst horrible and wrong, the opposition was born from tradition, rigid rules, superstition and fear. Brian allows us therefore not only to understand and get to know these brave, influential women, but also to understand society at that time. Brian also gives the reader an insight into the personal lives of these men and women; he did not rely solely on media and newspaper coverage – his research was extensive. You really feel like you know the characters as people, rather than figureheads. You get to know their families, their home lives, their fears and their struggles. It brings Hull’s history back to life. When Chrissie put her phone down in her little terraced house in Hessle Road’s Flinton Grove, she had to smile. Her trawlerman husband did not even let her go to the cinema unless he was ashore. She would be in big trouble when he got back from sea. Like a lot of the women, she feared the wrath of an angry husband, chastising her for “dabbling in men’s business”, more than she feared any fight with the bosses. But she was determined. Then he got angry and felt he was letting down his wife and baby by dying. He would not allow that to happen…Just keep going, Harry. Just keep going. The book taught me so much about Hull’s history that I personally knew nothing about. It’s a shame that before this book and before the press coverage, many people like me have no idea about the tragic and triumphant history of their own city and their own roots. Each city and community needs a Brian to help highlight and remind them of its past. Brian signing copies of the book. The book launch was attended by the Lord Mayor Mary Glew (as pictured below) and featured singers singing fishing ballads, press coverage, and a unveiling of plaques in honour of the four women who campaigned on behalf of the trawlers. There was a Q&A with the publisher Martin Goodman of Barbican Press (a publisher which I interned for last year) and a discussion with the audience. 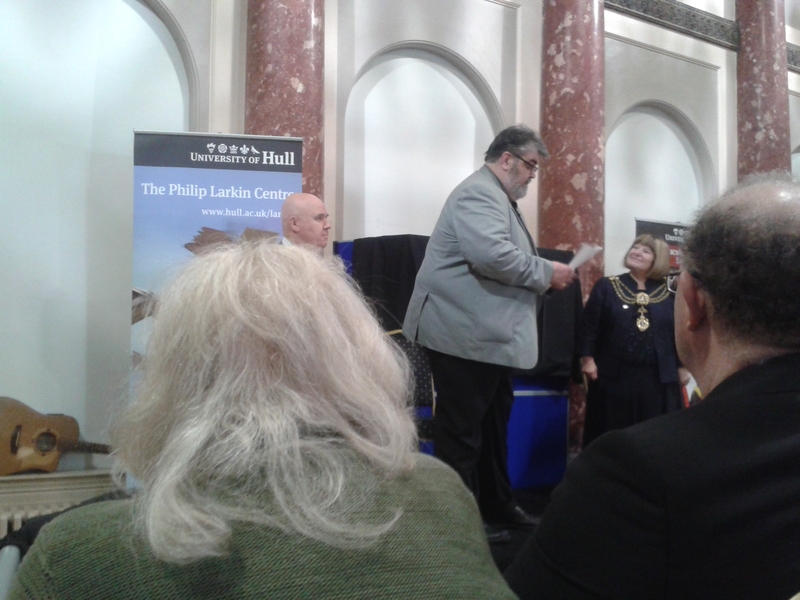 It was a packed-out event and a real triumph for Brian, Barbican Press, for the trawlers’ wives and Hull, City of Culture. During the Q&A, Brian told Martin that the story had been “overlooked for far too long”. He stressed that he needed to keep in mind the feelings of those involved in the story and who are still alive today. He was considerate of others before beginning this project (which, I should point out, was his PhD thesis.) However, as he pointed out, “The story HAD to be told.” And he’s told it extremely well. Brian Lavery with Lord Mayor of Hull Mary Glew. 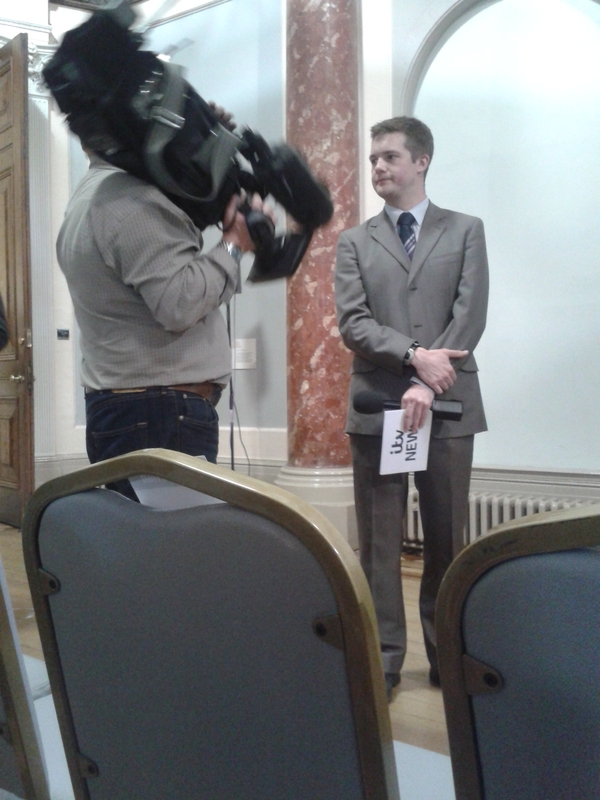 ITV news attended the big event.